When I was 8, Nickelodeon's Slime Tour made a stop at a local mall to hold auditions for Double Dare. I'm not sure what possessed me to try out (seeing as I could barely make it through a simple "hello" without having a nervous breakdown...I was THAT shy) but I begged my mom to take me anyway. For the auditions, we were rounded up in groups and paired off. My partner was a cute, bubbly little girl wearing a denim jacket (probably from Limited Too) with the sleeves rolled up. She was adorable. I hated her. They gave half of us a frying pan and our partners a bag of foam egg yolks. We were given one minute to try and catch as many yolks in the pan as possible. I didn't catch one single egg. The second part of the audition was the Q&A. One by one, we were sat in a Director's Chair in front of a TV camera and asked a few questions. "Who is your favorite Looney Tunes character?" Of all the characters I could have gone with, I went with the most obvious, uncreative choice. Not Pepe Le Pew. Not Foghorn Leghorn. Not even that witch who always left behind a few floating bobby pins whenever she took off, post-cackle. I went with Bugs Bunny. BUGS FREAKING BUNNY. I don't know if my selective memory chose to block out the remainder of the interview or if they picked up on the suckage and cut it short before I could bore them any further. Either way, that was the end of the road. I was escorted back to my mom and the Limited Too poster child made it to the next round. That being said, Kitchenaid and Hello Cupcake DC are holding a competition called The "Design Your DC" Cupcake Challenge tomorrow. All you have to do is create a cupcake inspired by the nation's capital. I've decided to give it a shot. I may be setting myself up for a giant repeat of that unfortunate audition. But I won't know unless I try, right? Anyway, I've spent a majority of this week preparing for the contest so I'll resume Sugared Cinema next week. In the meantime, I leave you with a pic of a cat in a dryer. Happy Friday, everyone. Wish me luck. Was that scene from B*A*P*S?!?! Anyways - good luck tomorrow Ali!! I can't wait to see your creation. I'm sure it'll be fabulous!! Did you ever think bugs bunny was hot dressed up as a girl bunny? I am sure your cupcakes will be splendiferous because I decided that made up words are best today. P.S. That dryer cat looks like my cat. I totally did a double take. But it's ok, Ziggy is still sleeping on the floor behind me. 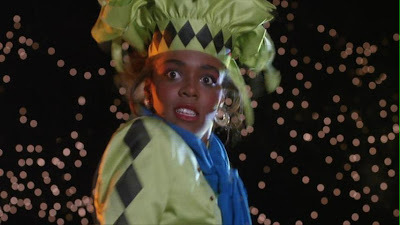 Don't Tell Mom the Babysitter's Dead!!! Great movie and so many great quotes. Simcoe? What is up with cats liking the dryer? I'm certain your cupcakes are going to rock so buena suerte, friend. 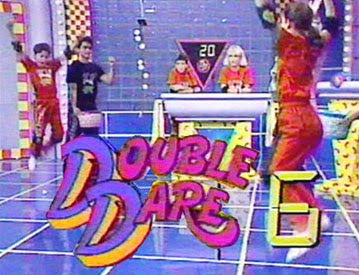 I wanted to try out for Double Dare but my mom is weak as in weak to run cause she runs with her hands in the air and she knows nothing of pop culture or any of that good stuff they used to ask on Double Dare. Awww, look at my grandcat Simcoe. I visited him a couple nights ago and he gave me the purriest greeting, sniffing and licking my Cajun Shrimp (OPI) toenails. Ohhh, and the Cupcake Challenge--what mom wouldn't be nervous, excited, wishful and proud. I can't wait to see them on your blog sweetie! Thanks for the support, everyone :D I'm really looking forward to tomorrow . The hand cramps from massaging fondant...not so much. Hyun - will you enter the next one with me? Celia - Exsqueeze me? Baking powder? Romanic Comedee - does your dryer cat prefer liquid or sheets? Margie - you win the petty cash award. "I have to get up at 5:30 every morning so I can beat rush hour traffic into the city and go sit behind a desk for eight hours a day and miss Oprah Winfrey everyday on my summer vacation. And then, I get to drive home in gridlock IN A VOLVO with no air conditioning just so I can take care of you guys and put food on the damn table!" Mom - thanks for the reminder to take pics. I meant to comment on your nail color the other night. Super cute. SO you. I totally though the picture was from "To Wong Fu: Thanks for Everything"
Good luck good luck good luck a million times! You've got mad cupcake skills, knock 'em dead! Ali - I don't think you need my help on any baking competition. You have this down! But I would love to spend a day baking with you (and eating everything we bake) in the near future! Good luck Ali! You got this. Good luck tomorrow! It sounds like a really fun event and I think it's so cool that you're taking part. I hope you take lots of pictures!! I am seriously jealous that you even got to audition! How cool. My mom never kept up with that sort of coolness. I would have loved to have tried out, although I was probably too old by the time they did that tour - or else maybe they never stopped off on Long Island.